Arriving at Cancun airport in the early afternoon, one was immediately conscious of the heat and humidity after leaving Canada with temperatures below freezing. 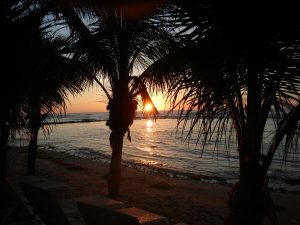 For those who have not traveled to Cancun before, better to arrange your transport to your resort before you leave. When you pass through customs, you are (purposely) directed through a myriad of time-share representatives and they will try to accost you and get you to opt in for either free transportation or other inducements to get you to attend a program. DO NOT BE SUCKED IN! Once you get through this area, you will see all the transportation companies outside. If you prearranged, you will likely see your name displayed by someone. If not, taxis are available and sometimes can cost less than the prearranged services. We traveled to this resort in late February, 2017 and enjoyed excellent weather with only one day of rain. 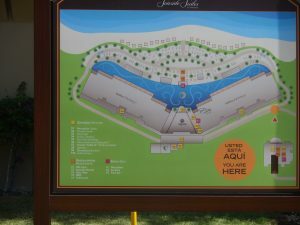 The El Dorado Seaside Suites (and the adjoining Sensimar) is located about one hour’s drive from Cancun Airport along the Mexican Hwy 307 and fifteen minutes from Playa Del Carmen on Kantenah Bay/Riviera Maya. If you elect to “share” transportation, it may take you a lot longer to get to the resort, depending on how many other passengers there are and whether they are being shuttled to a facility closer to the airport than yours. 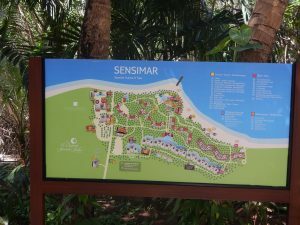 The original Seaside Suites resort has been renamed Sensimar when the new facility was constructed and has 400 rooms and suites. The new Seaside Suites (where we stayed) has 177 suites and most have Jacuzzis. Both resorts are adults-only and facilities are shared. In between the resorts there is a naturalist’s (nudist) facility, Hidden Beach, which is (naturally) isolated from the other two. Combining the two resorts, there is an abundance of places to eat and drink, as well as spa and fitness facilities. 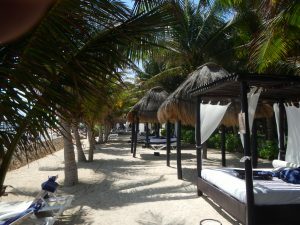 The resorts, like many in Mexico, are all-inclusive and would be in the higher end of the spectrum with high-grade restaurants and premium drinks as part of the Karisma “Gourmet Inclusive” program. When you arrive (or even before then) you will be appointed your personal concierge. Chrystal was our appointee and she was excellent and catered to all our needs. Within the area, there are numerous Mayan historic sites that you can visit, Chichen Itza and Tulum being the most popular. 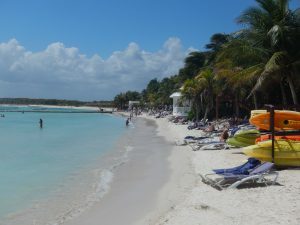 Other trips while in the area can be to Isla Mujeres, a small island just off Cancun and Cozumel, a much larger island off Playa del Carmen and a popular tourist and dive location. Also, plan to visit a cenote, a natural pit, or sinkhole, resulting from the collapse of limestone bedrock that exposes groundwater underneath and are quite abundant in this area. The Yucatan Peninsula area has almost no rivers and only a few lakes, as most of the rainwater makes its way back to the sea via underwater rivers. Go to the Lomas Travel desk within each resort for a multitude of other available activities. A story of a romance between a bell captain and a travel agent who met in 1979 has led to one of the biggest success stories in the Mexican resorts and travel business. Joe Martinez and his wife, Dolores, are the owners of the El Dorado Seaside Suites/Sensimar, Hidden Beach Resort, El Dorado Maroma, the El Dorado Royale/Casitas Royale with the newly constructed Generations (family) resort near Cancun, as well as Lomas Travel, the largest tourist transportation service in Cancun. More recently, at the Maroma Beach resort, they have added over-the-water bungalows, called “Palafitos”, a concept generally only experienced up until now in Polynesia. The start of another wonderful day. Within the last few years, a new reception centre was constructed along with three more restaurants, bringing the total number of eating facilities to eleven. There are six eateries for breakfast, six for lunch and seven for dinner (many offering combinations of breakfast and/or lunch, breakfast and/or dinner, lunch and/or dinner). Four of the restaurants are for dinner only and for two of them, reservations have to be made with your concierge. There is a dress code for dinner at all restaurants, but many guests were either unaware of it or ignored it. For men, it required formal Bermuda shorts, long pants, collared shirts, dress sandals or casual shoes. For ladies; Capri pants, dresses, skirts, long pants, shoes, elegant sandals. Peeked caps were not permitted at any time in any of the restaurants. While it is understood that vacationers are not always keen on “dressing up” while at a resort, they generally do enjoy the efforts made to create a nice décor in the restaurant. What they don’t seem to understand is that when they enter that restaurant, they become part of the décor, which is why dress codes are put in place. The rooms in the Seaside Suites side of the resort are great! Large and modern with a king-size bed, circular couch and writing table. Bathroom was excellent with a Jacuzzi tub and double sinks with separate stalls each for the shower and toilet. Virtually instant hot water at the tap, soft, fluffy towels and very good toiletries. The room opened onto a balcony that had two chairs and a lounge bed, beyond which was an opening to a pool that ran the full length of the building. As much as this seemed impressive, we saw hardly anyone actually use it and the water was not heated. Eating and drinking is what you come to this kind of resort for, as well as some relaxation and entertainment. This facility did not disappoint on any of those areas. Oddly enough, they have two Italian restaurants and both are called Mia Casa. We actually tried both of them and they offer the same menu. One thing that disappointed us was the unavailability of inclusive wines, which seemed to be the same in all but one of the restaurants. When you sat down to dinner, you were given a wine list along with your menu, but that list did not show what wines were included in your (GI – Gourmet Inclusive) package. Apart from the wines on the offered list being, in my opinion, way overpriced (there was no apparent credit in the pricing for the inclusive wine you were not having), many of the servers told us that some of the inclusive wines were not available…or had no idea which ones were available. 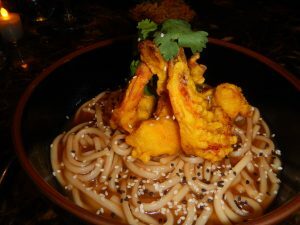 We had a similar issue trying to ascertain what whites were available and the only restaurant that actually offered us a list was the Asian one, Klay Talay, (so there was a list available). 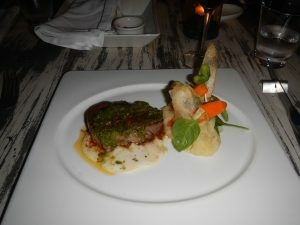 This was by far our best culinary experience, both from a food perspective and the excellent service. We were even visited by the sous-chef before we ordered our meal. The other dining establishment that was really good was the Gourmet Pub. (Incidentally, the Klay Talay and the Gourmet Pub were the two restaurants requiring reservations). The Pub’s menu, at first glance, did not seem very exciting, but what they served was excellent in its presentation and flavour. We had a power failure in the resort while we were dining there, but that didn’t really disrupt any of the operations. Candles were brought in and placed at each table and the kitchen (which was open to the dining room) managed with flashlights and cell-phone lights. Some of the other eateries we were able to experience were Arrecefes, a buffet-style restaurant where a different themed menu was offered each day for dinner. 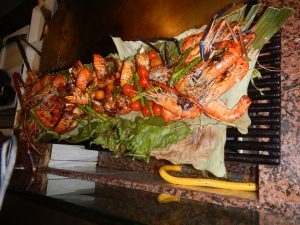 We had lobster when we dined there and you had a choice of various carved meats and a large selection of accompaniments. They are open for breakfast, lunch and dinner. Culinarium is a la carte style with an International menu and features floor-to-ceiling windows meant to give an impression of eating outside. The food was good but at the time we were there for lunch, the service was dismal for some reason (people arriving after us were served before us and had left the restaurant before we had our main course). We did return for dinner (and they recognized us and further apologized for the other day). This time, the service was much better. Arrecefes is open for breakfast, lunch and dinner. We did not get a chance to visit the Mexican restaurant, La Carreta, so are unable to comment on that. There are ample lounge chairs around the pool area and consist of teak chairs with pads. For me, the pads are not thick enough for me to find comfort, so we opted to use the large king-sized mattress beds at the beach (Bali beds). However, these are in short supply and one had to get up early to ensure you could get one for the day. It was not permitted to reserve one of these for more than an hour and attendants will remove items left there and allow other people to use them. Tipping these attendants can pay off, as we tried to get one at 9:30 one morning and none were available. However, the attendant indicated that there was one that was not used for over an hour, so he removed their things and we took the bed. When the couple returned at 10:30, the guy was naturally upset and said he got up at 6:30 to reserve it. The one-hour rule was explained to him but didn’t pacify him at all. The beach was nice, but if you want to go swimming in the ocean, this is really not the place to be. We watched as workers were removing underwater stones from a section of the beach in front of the newer Seaside Suites in order to improve it, but this is a long-term project and maybe two or three years before it is really usable. On the Sensimar side, they do have a better beach that has been cleared over the years. We found it to be quite windy for the duration of our stay there, and this is apparently normal for the Cancun area. However, the wind did keep you cool when the temperatures reached 30°C (84°F). For the most part, we stayed around the Seaside Suites area and ate most of our lunches at the Driftwood Oceanfront Restaurant and BBQ Corner. Similar areas on the Sensimar side are the Beach Barbecue and the Sandwicherie, where a variety of foods from hamburgers, wraps and pizza (from a wood-burning oven) are available. There is lots of entertainment offered although we did not avail ourselves of such. 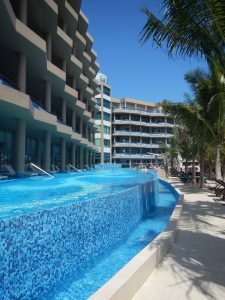 Activities abound in the pool area throughout the day; inside the pool there are Aqua fit classes and water volley and various other activities outside the pool, from Spanish classes to sandbag toss. Evenings were full with entertainment at the 4th floor Kanaloa Bar in the Seaside Suites that provided pool tournaments, Domino tournaments, Bingo and shows that included Jersey Boys and a live band. Elsewhere in the Sensimar side there was a Mexican beach party (which we did attend and it was excellent), a Fire show and a performance by Il Divo impersonators (we did not see them here, but were floored by their performance at a function while at the Casitas Royale – see post on that resort). The resort, if you include both of them, is quite large and requires substantial walking to get to the facilities. However, there is a golf cart service that runs on a regular basis to shuttle you to where you want to go. 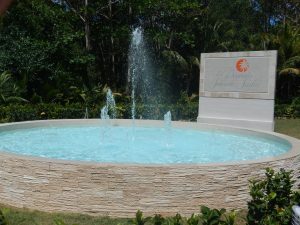 Overall, we were extremely pleased with the resort as it provided excellent facilities for the cost, so within the framework of value for money, I would highly recommend either one of these resorts. Remember that although gratuities are supposed to be included within your all-inclusive package, very little of this actually finds its way to your server. Although you can be assured that service will always be top notch, a small tip (we always used US$2 for breakfast or lunch and US$5 for dinner. However, we only did this if the service warranted it and in most cases it did. I am so proud of you…congratulations!